The VTS team is happy to announce the release of VTS 3.3 ! This version is called “Ozone” as a reference to the IASI-NG project that will contribute to weather forecasting, pollution monitoring, and climate research. VTS is involved in the validation process of IASI-NG as a support for CNES experts during instrument tests campaigns. VTS connectivity and extension capabilities have proven to be effective for implementing use-cases such as real-time telemetry decode, convenient scenario definition and human-readable data visualization. To see the complete list of features, improvements and bugfixes included in VTS 3.3 please read the full changelog. The Wavefront OBJ file format is now supported for satellite and component 3D models. A new 3DS loader is also available and can be used in case a 3DS model is not displayed correctly using the default default 3DS reader (see “Force legacy 3DS reader” property in Celestia initial states). Window manager options have been improved in order to arrange multiple windows at once. New filters allow you to find a specific VTS project entity (such as a satellite or region) or scenario state. Use Ctrl+F to focus the filter filed and enter a keyword or a RegExp expression (Perl-like pattern). VTS is now shipped with PrestoPlot v18.07 including new features and bugfixes (full changelog available directly in PrestoPlot : “Help” menu / “Version History”). As always we are interested in your feedback to keep improving VTS. Take a look at our contact page to send us any comment, suggestion or question you might have. We are very pleased to announce that VTS 3.2 “Zenith” has just been released and is available for download. VTS 3.2 owes its name to the new client application called “ZenithView”. Some of the new features aim to help the Operational Orbit Determination Centre (COO) at CNES in their work of avoiding satellite collision (FR article) with space debris or other satellites. ZenithView displays the celestial sphere as seen from a ground station. More precisely it displays a Lambert azimuthal equal-area projection of the celestial sphere centered on a specific ground station. Satellites and celestial bodies are projected according to their position relative to the station. As you can see in the image, objects outside the field of view can be projected on the horizon (or not displayed at all). 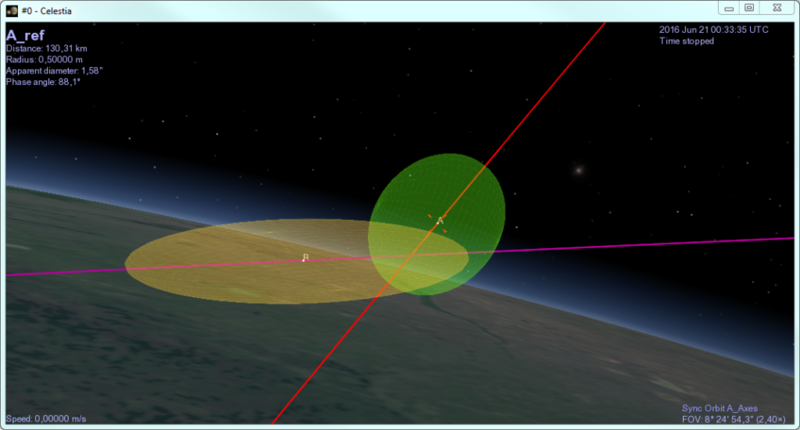 Ground stations now supports multiple (and orientable) sensors that can be displayed both in 2D and 3D. Visibility masks can now be defined for ground stations. Masks are defined in the station frame using azimuth/elevation data files and are displayed in ZenithView. The positional covariance of a satellite can now be displayed in 3D as an ellipsoid representing the uncertainty of an orbit state. This can be done with either fixed or time-dependent data. 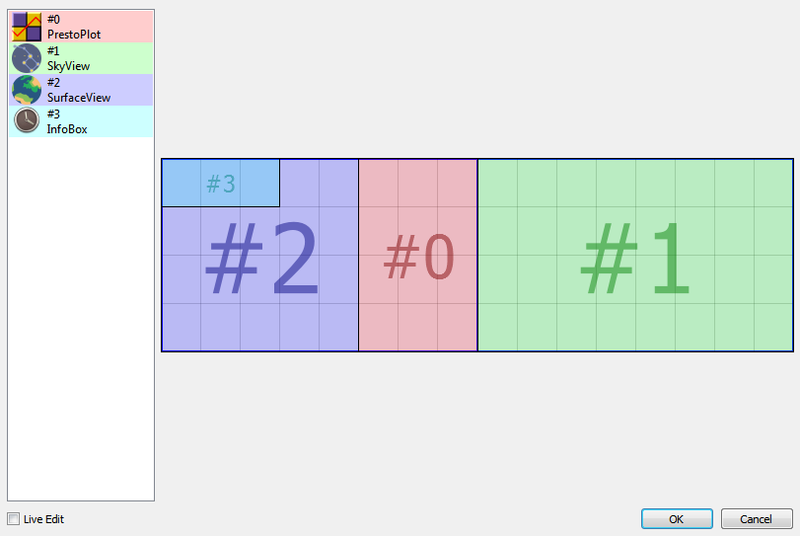 The new window geometry manager allows you to configure the position and size of each client application defined in your VTS project. Client applications can be easily placed on the primary or secondary screens and their positions and size will be adapted to different screen configurations. OmniView now supports Frameless and Always-on-top modes. As seen in the image below, these modes can be used to create more friendly and cleaner visualizations. A brand new HTML User Manual is shipped with VTS 3.2 and accessible from the Help menu in VTS. Contextual help is also available by pressing F1 key. VTS is now shipped with PrestoPlot v17.07. This is a big step forward bringing new features, performance improvements, and bugfixes to the VTS package. Synchronize your own application ! VTS 3.2 is shipped with examples showing how to connect and synchronize your own applications using Python, Tcl and Java. You will also find an XSD schema describing the VTS project in the [VTS]/Docs/Schemas directory. This schema allows you to generate an API in the programming language of your preference and to create valid VTS projects programatically. Please refer to the “Plugin development” chapter in the VTS User Manual. To see the complete list of features, improvements and bugfixes included in VTS 3.2 please read the full changelog. We are very pleased to announce that VTS 3.1 “Kourou” has just been released and is available for download. A lot of work has been put into porting VTS from Qt4 to Qt5. This opens the door to further improvements and shows that VTS is looking towards the future. This also means that VTS will no longer be released for some old platforms although support will continue to be provided. 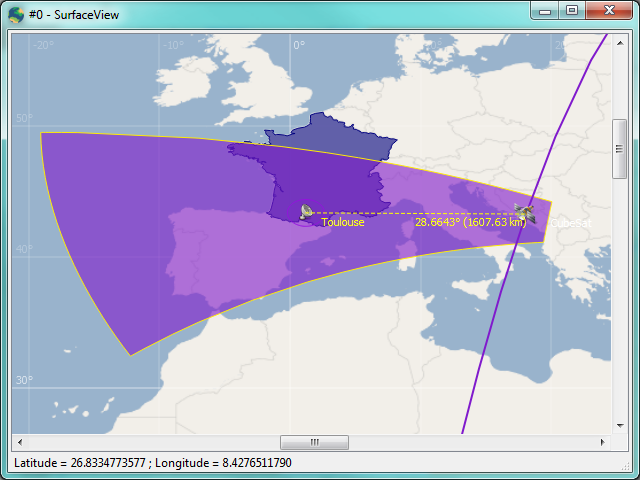 WMTS (Web Map Tile Service) protocol has been added for tiled maps. 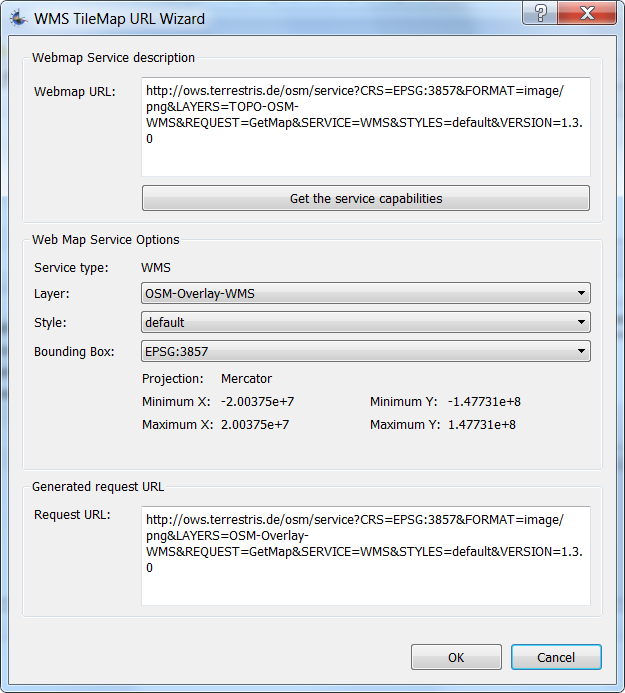 A new wizard helps in defining WMS/WMTS URL adresses. An interesting feature that can be used in any of the previous modes is the ability to make POI-to-ROI and ROI-to-ROI distance measurements. 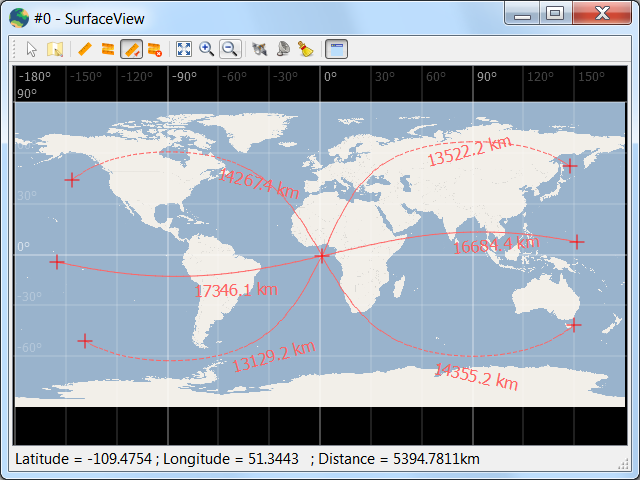 By using using Shift+click over an ROI, the shortest distance from the region boundaries to the cursor is displayed. Measurements can also be direction-constrained using the Alt key. 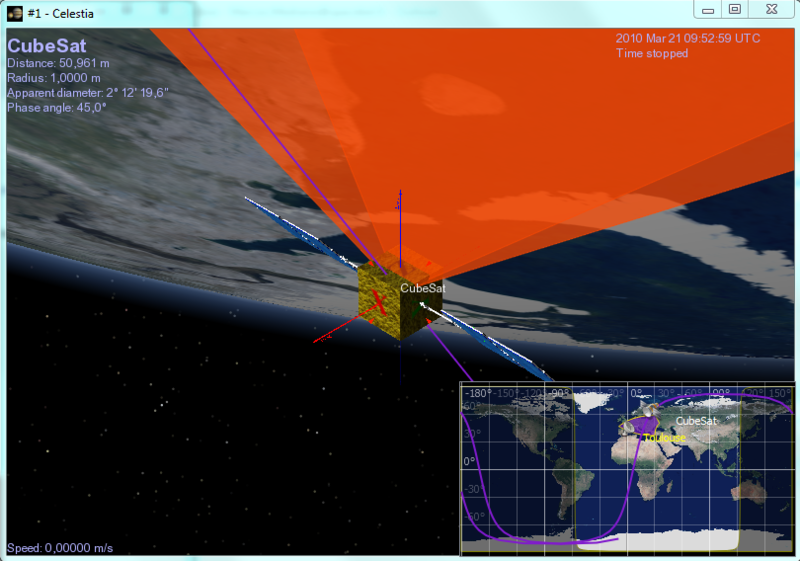 VTS 3.1 “Kourou” introduces some new features related to the geometrical visibility between a satellite and a ground station targeting its altitude. To see the complete list of features, improvements and bugfixes included in VTS 3.1 please visit the changelog. As always we are interested in your feedback to keep improving VTS. Take a look at our contact page to send us any comment, suggestion or question you might have. You are also welcome to share your screenshots or videos so we can publish them in the website. We hope you enjoy this release and we wish you a pleasant and productive experience with VTS. On the 2nd of septembre 2016 the Rosetta OSIRIS NAC camera captured an image of Philae from an altitude of 2,7 km. Here is an animation comparing the real image and a VTS simulation to illustrate each part of the lander on the NAC image and find out the Philae attitude.